Home Uncategorized CALLING ALL PLAYWRIGHTS! 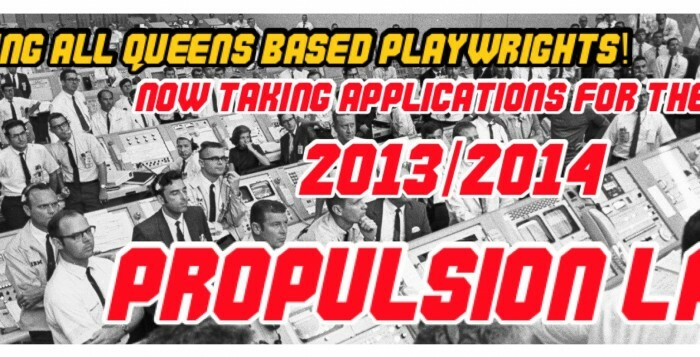 Apply to the 2013-2014 Propulsion Lab! As we bid a fond farewell and wish the best of luck to Jane Miller and Jennifer Lane as they both migrate west, we are looking for a few amazing playwrights to join us in the 2013-2014 Propulsion Lab. The Propulsion Lab is a bi-monthly writers group for Queens-based playwrights, curated by MtD co-founders Kari Bentley-Quinn and Don Nguyen. This past June, our Lab culminated with ALL SYSTEMS GO! – an evening of excerpts from plays written during the course of the Lab. The excerpts were read by super talented actors at our partner theatre, The Chain Theatre. The evening was sold out and a huge success. We are hoping to do a similar presentation next June and we hope you can be a part of it. Willing and able to attend bi-monthly meetings. Regular attendance is very important to the continuity of the work and to support your fellow writers. The deadline to apply is August 15th! SUBMIT TO THE PROPULSION LAB 2014-2015! All Systems Go: Mission 2!